FSR has launched the OWB-500P, the newest addition to the Company’s Outdoor Wall Box series. FSR’s new OWB-500P box features locking white doors as standard with color and decorative selections, including windows, offered upon request. The stylish covers have “flip up” cable entry doors so that the main cover can be locked once the cables are connected, and every OWB-500P is equipped with FSR’s enclosure box light - LITE-IT - for connecting in dimly lit areas. Custom interiors are available to meet each individual application. The box's square shape allows mounting in any orientation so the door can swing left, right or up. It is available in flush or surface mount models and includes blank plates for custom mounting. The OWB-500P’s design provides a safe and secure mounting for a variety of control panels including hard switches, elastomeric pads, touch screens, IPS plates and infrared pickups. The 8” deep OWB-500P features internal brackets that can be arranged to provide numerous options for both high and low voltage. 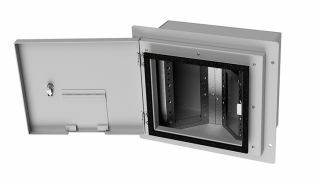 Standard gang openings make it the most flexible and easiest-to-install wall box available, while removable center dividers allow cables to be passed through the various compartments in a flash. The enclosures are constructed in NEMA-4 style and with the integral door, will meet the NEMA-3 and 3R ratings providing protection against falling dirt, rain, sleet and snow. The OWB-500P is shipping now.